It is often said that Blackmoor was a CHAINMAIL campaign, meaning that the CHAINMAIL(TM) table top miniatures rules formed the bases of the Blackmoor campaign and provided the rules used for the clashes of armies between the forces of good and evil. It is a "truth" repeated so often by so many voices over the years it is surely something "everybody knows" and has known for a long time. So why question what everybody knows? I might say: "Because nobody does. ", but that's not completely true. I won't cite quotes from specific personalities, (pro or con) because I'm not looking to call anyone out or burn any heretics, but suffice it to say that amid those who have opined on the subject, several of the original Blackmoor players have, from time to time, made the seemingly odd claim that they didn't play CHAINMAIL at all in Blackmoor. To be clear, what I'm specifically talking about is the rules of CHAINMAIL as the basis of the wargaming component of Blackmoor. CHAINMAIL isn't an RPG ruleset or a guide to world building, it is a wargame, so the narrative understood by addressing Blackmoor as a CHAINMAIL campaign is that when battles were being fought by armies or just men and monsters it was under the rubric of the CHAINMAIL ruleset. In other words, CHAINMAIL was the go to set of rules for battles and warfare, which in turn, so the narrative goes, was the initial and primary focus of the games. It is the first part of that narrative, the CHAINMAIL as the rules for Blackmoor wargames, we will examine here. Our primary documentary sources for the Blackmoor campaign 1971-1975 are The First Fantasy Campaign(TM), The Corner of the Table Newsletter, and the Blackmoor Rumormonger and Gazette newsletter. What follows is a thorough but not exhaustive look at these sources. I've gone through and isolated "rulesish" references that point to or from CHAINMAIL as a source and I've divided these into pro and con segments. First - Evidence in favor of Blackmoor as a CHAINMAIL campaign. Blackmoor derived these terms from CM. There is absolutely no reason to think otherwise. Below is a table comparing hand to hand weapons. For simplicity I excluded projectile weapons, however very similar results can be obtained for that class of weaponry. 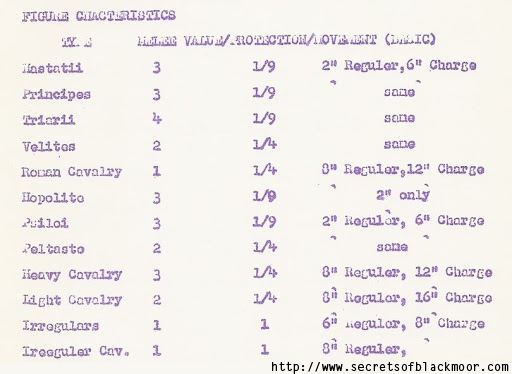 The first column contains the weapons list from the CM 1st edition Man to Man table, the second is from the list found on Pete Gaylords very early Blackmoor character sheet, and the third column is from an equipment list found in the FFC. I have retained the exact order, spelling, misspelling, and punctuation in each case. "Halbear" is separated from Pole Arms. The third column FFC list is also nearly identical, but for some minor rearrangement and spelling. There can be no doubt that Blackmoor Weaponry lists came straight out of CM. The FFC gives extensive statistics on the various forces engaged in the "Great Coot Invasion" miniatures battles. The Coot invasions were medieval fantasy battle scenarios Arneson organized to take place in Blackmoor within the first year of play. The tables given in the FFC are those of the 3rd coot invasion, which we can be sure due to certain price changes, are taken from the second edition of CM. Below is a comparison, in order of unit types listed in CM and in the FFC Coot invasion tables. As can be readily seen, the lists are nearly identical, aside from two adjectives (fyrd, local). Clearly once again we see Blackmoor drawing directly on the CM rules. The table above illustrates the comparative costs in both sources. One can readily see that Blackmoor derives it's basic cost structure from CM, multiplied by a factor of 10, with some variation. Another clue showing the relationship of CM to early Blackmoor are monster lists. The first column of the table below shows all the "Neutral" and "Chaos" monsters listed in CM (75:39). For convenience I've relisted them alphabetically. One of the oldest pieces of material found in the FFC is a table of wandering monsters for wilderness encounters - those monsters are listed in the second column. The third column is from a stocking list of the Loch Gloomen monsters dating to summer 1972. Notice that both Blackmoor tables are similar subsets of the CM list. The FFC wilderness monster table does add three types of men, Trolls - a CM monster seemingly forgotten on the chaos/neutrals lists, and possibly a new monster - the Wright - which is likely some kind of wight/wraith combo. However, these few additions do not disguise the fact early Blackmoor was populated largely with monsters straight out of CM. PART TWO - Sand in the Air. We've already seen a lot of unequivocal evidence pointing to the presence of CHAINMAIL in Blackmoor. The question of Blackmoor as a CHAINMAIL campaign seems like an open and closed case. For anyone familiar with the Twin Cities gamers that really ought to be quite a big surprise. Why? Because of Strategos. Strategos N (Napoleonic), if you are not familiar, was David Wesely's distillation and adaptation of Charles Tottens 19th century "Strategos: A Series of American Games of War" book into a set of wargaming rules used by the Twin Cities gamers. However, Strategos N wasn't just some pet set of rules introduced to the group by one of it's members for some of his games, Strategos N quickly and completely dominated their game play from the late 60's onward. Strategos was their set of club rules. They soon began to develop appendixes and amendments to cover different campaign and time periods. Virtually all the membership became invested in the Strategos ruleset in one way or another. The Corner of the Table newsletter from the 1960's is rich with Strategos related material. It was practically all they talked about. Several historic period variants were typed up and published separately, including an Ancients variant co-written by Dave Arneson and Randy Hoffa. Perhaps the reader will recall an old story Arneson and others related of a battle featuring Roman legionnaires and a druid with a Phaser? (DW#3, Space Gamer 21, et al) That was a Strategos A (ancients) game. So, given the deep investment the Twin Cities group had to "their" Strategos ruleset, it should strike any Blackmoor researcher as curious surprise that they would switch to a new and quite different set of rules for the Blackmoor campaign - especially considering that the club member organizing the affair, Dave Arneson, had already authored a set of Ancients rules readily adaptable to the period with a few tweaks. One would think a rule switch like that is something that might be remembered or have triggered some discussion and controversy. Well, actually in fact it did, but only as regards the tactical, individual combat layer of play. One of the earliest games in the Blackmoor setting was the Troll bridge game that occurred on April 17, 1971. Arneson has stated that the earliest games used CM's Fantasy Combat Table, and we can be fairly confident the FCT was used in this game. Of course, a successful roll on the FCT often results in an immediate kill and it so happens that in the troll bridge game one of the players was killed by just such an immediate strike. That player was Bob Meyer, and he wasn't happy about it. "I was in the game that had that troll, and I did not care for the rules. The troll killed me in no time at all, and I was a hero! I refused to have anything to do with Blackmoor for a very long time after that." (Source ) Complaints such as this one are what Arneson claimed led him to develop the concept of Hit Points and develop different mechanics for individual combats. However, as regards the focus of this essay, for the wargames, battles and larger scale encounters in Blackmoor, the historical materials we have from the time are entirely silent on the matter of a new or different rule system. There were no similar complaints or comments or praises in battle reports involving the use of CM. The only player discussion touching the subject is from years later does vary. Some have stated CM might have been used for some battles while others flat out deny playing by the CHAINMAIL rules at all. Curious. Thus far, we've looked at where early Blackmoor material clearly points to a close relationship with CHAINMAIL. We've seen fantasy types, troop types, monsters, and some spells - compelling evidence to be sure - but the question remains as to whether the actual CM rules were employed to resolve battles. Does any "rulesish" evidentiary material point to CHAINMAIL or Strategos anywhere else, and what might the relationship between CHAINMAIL and Strategos, if any, be in Blackmoor? First, I will exam facets of early Blackmoor that buck the CM trend we've seen, problematizing CM campaign issue. We should tackle the end of that quote first, because at first blush it would seem to be strong support for the thesis that Blackmoor was indeed a CM campaign. It would be unwise to be so confident however, especially given Arneson's fondness for hyperbole and less than precise use of the English language. "Combat" here should not be seen as necessarily synonymous with "battles", but rather with "fights", meaning individual character melees as much as anything. After all, these swords were set up for use by individual adventuring characters. Further, it is less than clear what Arneson meant by "basis". Certainly, as we have shown above, CM formed the basis of the material components of weapons, troop types and monsters in Blackmoor, but we should remain cautions regarding the extent to which rules were employed. Lastly we should note that Arneson here is speaking topically of the initial development of Blackmoor when magic swords were first created, not of course the entire Blackmoor Campaign which stretched well into the era of published D&D. Of greater import for the purpose of examining CM rules in a Blackmoor context, is Arneson's curious claim regarding "The nature and the powers of the spells... "
"Double Values" as a term doesn't appear in CM, but the idea can be made to make sense in the mass combat rules. The Lycanthrope entry gives an example. "If they are fighting inside of or within 6'' of , a wood, they will double their melee capability. Lycanthrope attack as four armored foot and defend as four heavy foot." So in this case, "double their melee capability" to attacking as eight armored foot and defending as eight heavy foot, might be taken as synonymous with attacking at Double Values. How double values might apply on the Man to Man or Fantasy Combat tables is unclear, but we might assume it should mean two attack rolls. However, there's a problem with this interpretation. Notice on the example sword "Grey" above that it also has a +8 Combat increase statistic. How does one reconcile a +8 combat increase with a double value attack in CM mass combat terms? There is no statistic to add +8 to in the mass combat rules. It's nonsensical. For example, using the CM mass combat rules, a hero attacking as as four heavy foot against a light footman would roll 4 dice, with a 5 or 6 indicating a kill. The same hero wielding "Grey" would get double values against Mortals, meaning 8 dice rolls with a 5 or 6 indicating a kill. As can be seen, there is nothing to add the + 8 combat increase to. Yes, possibly, the Combat Increase was supposed to be ignored in mass combat. Perhaps it was meant to be something added to an attack roll in conjunction only with the Fantasy Combat Table (FCT) and Man to Man rules, while "Double Values" translated into two attack rolls on those tables. Again that's problematic, as "mortals" aren't part of the FCT and neither are Puddings for that matter, and Fantasy creatures like ghouls don't fight on the Man to Man tables. Further, both of these are 2d6 tables. Adding as much as 9 to a 2d6 roll seems extreme. So, while it would seem the natural meaning of Combat Increase should be a bonus to an attack roll, the CM mechanism for attack rolls are not well suited at all to the range we see for the Combat Increase bonus. Nevertheless I suppose you could work around these difficulties, such as by switching back and forth and adding new tables. However, what about cases of triple, quadruple, or even six times values? Was Arneson really suggesting an Elf wielding the magic sword Grey in battle with a troll would get 6 unanswered rolls on the 2d6 FCT with a +8 bonus to each (or at least one) roll? Why would you do such a thing? One way to reconcile Combat Increase with CM is if we assume "Combat Increase" really meant "Hits Increase" applying to the "hits" (hit points as Arneson devised them) of either the wielder or the victim. If applied to the victim as a kind of "damage bonus" we face the confusing issue of how a combat increase which adds a damage bonus works with multiple values across three different CM systems, when those multiple values also multiply damage, as we saw earlier. Going back to our Elf wielding the magic sword Grey in battle, this time against a goblin. The elf gets double value hits - neither of these creatures are on the FCT so presumably you would have to adapt to one of the other tables to determine a hit. If the elf does hit and scores 4 points of damage, doubled to 8, plus a combat increase of 8 for 16 points total. Such a system seems needlessly redundant, but is seemingly workable. On the other hand, if the Combat Increase is applied to the hits of the wielder, the bonus is more straightforward, though we are still left with the issues previously described for "doubling" etc. values, both on offence and defense. In short, with some fiddling things can more or less be made to work, but it is particularly suspicious that Magic Sword combat statistics and terms fit so incredibly awkwardly, if at all, with the CM combat rules they were supposedly designed for. Now let's turn to those "powers of the spells" Arneson claimed were lifted from "the available copies" of CM. The table below shows all the "Special Values" powers of the early Blackmoor swords and a reference in CM to an identical power. *Magic ability refers to any magic spells the sword could cast. Arneson determined the spells by random rolls on a spell list we don't have. There are only 6 spells in CM 1st edition, yet most of the swords with Magic ability have more than 6. In fact in the "color swords" list there's one with double magic and 17 spells. It seems unlikely that these would all be multiple copies of the same 6. Further, one of these spells is "detection" which is already a part of the list above. Arneson chose only 10 such Special Values powers for his swords, two of which appear to have no parallel in CM (Dragons, Evil Detection) and a third (Magic Ability) which is paralleled only in the sense that it describes the power of wizards. The remaining 7 Special Values can be found in the booklet, but aren't as straightforward as Arneson's quote makes it seem. Interestingly, 6 of the first 7 found on this list are on Arneson's Special Values list - the odd one out being "B - split move and fire", which seems a perfectly logical power to exclude. The remaining 5 are nowhere to be found despite there being no obvious reason that powers like "change to flame" "shape change" and "cast fire" should be left out. A seventh Special Value "magic detection" could also be drawn from CM, being found as part of a wizard spell, but not found on the appendix D list. The spell "Detection" in CM detects the type of magic or the location of hidden enemies. So, while the "detect magic" part of that is in the swords Special Values list, the "detect enemy location" portion is not, nor is it part of a separate Special Value power. Since "Detection" could be a spell that a sword with "Magic Ability" could have and would therefore be partially redundant with the Special Value, it may be that Arneson didn't realize "detect magic" was part of the Detect Spell when he made the list. The situation overall is curious, because while some of the Special Values powers were taken from CM, at least three were not, and those that were drawn from CM are only a seemingly arbitrary selection from the first half of the Appendix D list, of what could have been used. That doesn't make a whole lot of sense if the goal was to adapt and ascribe the magic powers of CM to the magic swords of CM. Instead it looks more like a case of raiding an existing list to flesh out something of Arneson's own design. It is particularly suspicious that 6 of the first 7 powers of the appendix D list are there. It is almost as if Arneson came up with 4 Special Values powers on his own and, perhaps running out of ideas, turned to the Appendix D list to fill out the remainder to 10 - a number convenient for use with the d20 dice he acquired in England. Taken as a whole, the magic swords don't seem to have a very tight or orderly relationship with the rules of CM. I don't think the evidence is conclusive, but it does seem to point to systems of magic and combat developed independently of CM without intent of compatibility. That wizards would be included in a fantasy wargame is practically a given. We've already shown that "hero" titles in Blackmoor tie directly to CM and "wizards" are surely no exception. That said, it is clear that wizards and magic in Blackmoor are quite distinct. In 1st edition CM, under the description of Wizards, there are three types of what we would call magic users: "WIZARDS: This class includes Sorcerers and Warlocks." (71:37) Second edition adds Magicians and ranks the types in terms of power. These all have the ability to turn invisible until they attack and to see in darkness. It's been argued that these CM magic types were ported directly into early Blackmoor, essentially forming 3 levels of Wizard, expanding to 4 with the printing of CM 2ed in 1972. The problem is these CM "ranks" are rare to non-existent in early Blackmoor material (pre D&D). "Sorcerer" as "wizard or sorcerer" appears in the write up on Blackmoor Arneson wrote for publication in the Castle & Crusade society newlsetter (July 1972), and that's about the extent of it, with the only similar reference being found in the Loch Gloomen report in CoTT V4 #5 to a level 12 ! Sorceress. So we see, not just the three ranks of wizard in 1st ed. CM, but at least 8 levels of wizard operating in early Blackmoor (12 if the Sorceress counts). A level 6 wizard, as indicated in the Coot Invasion tables from the 1st edition CM era, makes no sense at all in terms CM rules. Levels aren't the only problem shown here, we also see something perhaps even stranger in the context of a CM campaign. We see a number of combo, or what we might now call "dual class" characters with seemingly any mix of level in each type possible. There is a short section at the end of the CM rules discussing such Combination Figures. In CM wizards have their own combat rules, and of course, heroes have theirs. They don't mix and the Combination Figures paragraph in CM contains little guidance beyond saying they should be rare and not too powerful, otherwise leaving it entirely unclear how you would even begin to handle a melee involving a multi-level hero/wizard character in CM. In Blackmoor, these combo figures are neither rare nor low powered. Arneson must have created his own procedures for handling these combo figures, whatever the ruleset being used. Segueing to magic, the Blackmoor system resembles nothing we see in CM. In 1st ed CM there are six spells given (phantasmal forces, darkness, wizard light, detection, concealment, and conjuration of an elemental) and there is every reason to think Arneson ported these spells into Blackmoor, along with the spell like abilities of fireball and lightning bolt. However, the CM method was for a player to choose from among these spells for a particular Wizard figure to have and be able to cast repeatedly during a game. The spells themselves once cast, never fizzled. CM magic and Blackmoor magic utilize two entirely different, and contradictory approaches to spell casting. It's clear that while the "wizard" and perhaps to a lesser extent, magic, as game elements, borrow some pieces from CM, the rules governing their use in play in Blackmoor stood independent of the CM rules, apparently from very early on. Blackmoor wizards were not CM wizards at all. What we have seen so far with magic swords, and especially with Wizards, Wizard Levels, Magic Levels and Blackmoor Alchemy, is that they utilize terms and methods that are not familiar to CHAINMAIL at all and in some cases are seemingly incompatible with that ruleset. We see what are apparently new rules. Nevertheless, new rules, no matter how contradictory and how awkward the fit, could be argued to be "houserule" amendments to a CM based game. We haven't yet seen anything that outright contradicts CM or that points directly to Strategos, or any other ruleset, and so we come to our last segment. PART THREE - Evidence for Blackmoor as a Strategos Campaign. The fact that the game elements we have examined so far work perfectly well in a Strategos based game and not so well in CHAINMAIL is no proof of anything. To suggest Blackmoor was in fact Strategos based at the campaign level, we would need to show elements that are directly specific to those rules. We have two cases to examine. It's certain that these monsters owe their inclusion in the Blackmoor Campaign because they are drawn from CM, aside from Tarns and the human types. Tarns, however are said to be the same as Rocs, and Nomads and Bandits are divided into CM troop types. The "hits" (hit points) of all the monsters also usually come from the CM point cost of these monsters, but are adjusted to fit into d6 ranges like 4-24. However we also find a wealth of new information in Arneson's monster listings. In fact, it is interesting that these monster write ups exist at all in the context of a CHAINMAIL campaign. There is simply no reason to create a new description and rules for monsters that are already well defined in the CM booklet for the purposes of running battles. So why would Arneson bother? Let's consider one example that appears to be particularly informative. "These creatures carry their wealth with them and vary in size. Wealth ranges from 2 - 12,000 Gold Pieces and from 12 -72 hits with those over 36 getting DBL attack value with 3/2 missile and 3/2 movement. In Woods 8 - 48 Hits; 3 -18,000 Gold Pieces in MTNS. In groups of Giants, only one may be over 36. However, total Gold for Giants over 36, or travelling with one. is increased by 3/2. 4. Building (as square tower; one per two Giants. Captured as Dragons, 1000 x point value for worth." The FFC giant entry can be considered supplementary to the CM entry. Arneson adds information crucially important to adventuring, such as how much gold giants in different encounter locations might have. It is just the sort of information one would need to run encounters with Player Characters, and arguably this is the main reason these entries were created. "....those over 36 getting DBL attack value with 3/2 missile and 3/2 movement." As a side note, that 3/2 missile and movement rule puzzled the heck out of me for years, so I asked some of the original Blackmoor players if they knew what it meant and Ross Maker supplied the answer "...they move 50% farther than usual and have a 50% longer missile range (usually thrown rocks, etc. for giants)." Again we also see Double Value mentioned. As we discussed earlier, "Double Attack Value" can be made to make sense in CM mass combat terms, but becomes a question mark when applied to combat on the FCT. In this case, in CM terms, giants with over 36 hits would presumably attack as 24 Armored Foot instead of 12 and get two rolls on the FCT. That's a real possibility, but here's the thing; nowhere in the entire monster section do we see any explanations like that given in the paragraph above, using actual CM terms like "24 Armored Foot" or two attack rolls or what have you. That's just peculiar. Instead what we actually see are lots of references like those in the Magic swords section to attacks at double and quadruple values. In a few cases we see even six times normal attack value. So again, in terms of a CM campaign, it is very strange that across the 12+ monsters described we never once see combat strength expressed as "x# Foot" or "fighting cabpability" as it always is in CM. Instead it is always "x# Value" in the Blackmoor material. Why? Without going too deep into the Strategos rules, suffice it to say that a troops' Value is the core statistic used to determine the "odds" of opponents in combat, which is then resolved in accordance with dice rolls referencing "Table T". In the Strategos A example above, a unit of Heavy Cavalry fighting at Double Value would have a base Melee Value of 6 instead of 3. The use of the term "value" throughout both the Magic Swords and Monster sections of the FFC are a strong indicator that Arneson is engaging in a conversion of the CM combat terms and stats into something compatible with Strategos. Of course, this isn't unequivocal evidence of Strategos. One could argue that the use of the term "values" throughout the early Blackmoor material was merely one of habit and familiarity, and doesn't necessarily mean the Strategos battle rules were employed instead of CHAINMAIL rules when dice began to roll. Indeed, Arneson continues to talk about double and triple values in his 1975 Temple of the Frog adventure which is quite clearly written with D&D in mind. That's a fair objection. Nevertheless the continuous use of the core Strategos term coupled with the complete lack of CM "x# Foot" etc. certainly favors a Strategos rule base for the Blackmoor Campaign. If it is intended to bear any semblance to reality, morale will be at the heart of any good wargame, as indeed it is for both CHAINMAIL and Strategos. Here is how morale works in CM. There are two types, "Instability Due to Excess Casualties" and "Post Melee Morale". "Instability Due to Excess Casualties" is a check that occurs when a unit has suffered casualties below a certain percentage allowed for that type of unit. When the casualty threshold is crossed, a saving throw must be made or the unit will be removed from the game. These morale rules are core functions of the combat system. The difference determined in the post melee morale calculation results in either a continued melee, a forced movement, a retreat or a route. The morale "condition" of these units doesn't change, that is it remains in good order, unless they are in retreat or route. Otherwise, when not directly in combat, morale is not a factor. The "morale rating" figure used as part of the above process, might, upon a cursory glance at the rules, seem to be a possible candidate for what Arneson referred to as Morale Condition and/or Morale Level, despite the fairly clear semantic distinction between a condition, a level, and a rating. A closer look shows morale rating to not be a reasonable fit, however. Morale Ratings, to be clear, are a number assigned to a type of unit or monster for use within the post melee morale calculation. The Ratings range from 3 for peasants to 50 for wizards and Balrogs. Rans' army was composed not just of men, but a menagerie of CM monsters also, so so a -3 morale condition and a +2 morale level must apply to a rule that covers all monsters and men sensibly. CM morale ratings are a static number used to perform calculations in a formula. They do not go up or down as steps or stages or levels. Further the whole 3-50 range would be affected. If you were to apply a -3 to a unit while calculating post melee morale (nevermind for the moment that the FFC implies all troops are affected, not just those in melee) you would have a situation where peasants use "0" in their post melee calculation, heroes use 17, and wizards use 47. The way the formula works, the 0 rating for peasants would produce an extreme swing in the final numbers while other creatures would hardly be affected, contrary to the point of the rule in the first place. There are also a number of CM creatures that have no morale rating at all, such as trolls and dragons, so there would be nothing to subtract the -3 morale condition from or add the +2 morale levels to. It's pretty clear we can rule out any conflation of the Ran's morale condition and level terminology with CM's morale ratings. Let's compare the highlighted information to our CM rules. The first and last items highlighted are related so lets look at the second item first. That can be restated as "adding new troops to a combat will negate the -1 penalty and allow a throw to be made normally". There is no complementary rule in CM like this. That is, there is no rule in CM whereby a player would "need" to bring in additional troops to avoid or cancel a penalty while affecting a "morale condition". It doesn't make any sense in CM terms. Neither "Instability Due to Excess Casualties" nor "Post Melee Morale" has anything like a "Morale Level". The statement makes no sense whatever in CM. There are no levels. CM troops are either in good morale, or they are in retreat or rout. Likewise there is no way to subtract -3 from their morale "condition". There is no list or statistic representing morale conditions or states. The special instructions for when the player of the Ran of Ah Foo engages the forces of the Duchy of Ten in battle are simply nonsensical jibberish in a CHAINMAIL based game. In Strategos, adding new troops to a melee increases the combat odds. The Blackmoor rule appears to be taking this into account by negating the -1 penalty. Certainly, unlike with CM, the Blackmoor rule makes perfect sense in Strategos terms. To examine these two statements, we need to look at how morale works in Strategos. Here is the Morale Table in Strategos N:1. Seem Familiar? Perhaps you have seen the version published in the Arneson/Gygax collaboration from 1972, Don't Give Up The Ship(TM). It should be no surprise this table shows up in DGutS as that game is essentially a naval variant of Strategos. Here is how the tables above work; At any given time in the game, no matter what they are doing or where they are, all units have a morale condition or class. Typically, troop morale will of course be "Normal", but will move up or down morale levels according to circumstances. A unit at Normal condition that achieves a victory will move up a level to "Flushed with Victory". For the Ran's forces, while a battle unfolds according to the pre written plan, the morale of any given unit is two levels above what it would otherwise be in any given situation (most troops would therefore be flushed most of the time). When the pre-written battle plans are no longer being followed, the morale condition of all units drops 3 levels from what it would otherwise be in any given situation. Applied to the Strategos rules, a -3 on morale condition means that if the unit started in "Normal" condition they would drop 3 levels down to "routed" condition. Troop would go from Flushed to in disorder, and from Normal to routed. This makes perfect sense as the point of the rule is that the Ran's army is so conditioned that deviation from the plan is catastrophic, but adherence to the plan is highly beneficial. One might well wonder who would want to play under rules like that, and it is hard to say if anybody ever did. The reason behind the whole thing, was an ongoing disagreement Arneson had with Randy Hoffa over his attempts to set up a rival Napoleonics campaign. This description of the conditioning of Ran's troops and their morale rules was, of course, a thinly veiled character jab at Randy Hoffa. Taken in context, there should be little doubt the the Blackmoor player instructions for the Ran of Ah Foo are referencing the Strategos morale and combat rules so well familiar to all those in Arneson's gaming circle. This was the lingua Franca they all shared for the rules they all used. From the time Wesely discovered and distilled Totten's rules in the mid 1960's through the mid '70's Strategos ruled the table for Arneson and company. They used Strategos N as the building block for games set in the Russo Turkish war, the American Civil War, the American Revolution, Ancient battles, Medieval battles, WWII armor conflicts, and all the Braunstein games. The Twin Cites gamers lived and breathed the Strategos rules. Indeed, they still play them. To those gentlemen, the references to values and morale levels in the FFC were immediately recognizable, but to the gaming community at large who's knowledge of and exposure to Strategos was limited and who's relevance remains downplayed at best, the confusion is certainly understandable. However, we can now draw the inescapable conclusion: The battles in Blackmoor were being fought with Strategos as the go to rules, not CHAINMAIL. As with any piece of deductive reasoning, the strength of an inescapable conclusion rests entirely on the strength of the premises. In our case, Strategos makes immediate sense of the terms and data presented, whereas CHAINMAIL leaves one bewildered trying to make it work. The evidence shows that it is perfectly accurate to say the the first Blackmoor games began with CM in hand. It is also undoubtedly true that a couple of the very first experimental games in the setting utilized the Fantasy Combat Table in CM. However, for the remainder of the campaign, character combats were resolved, first with Arneson's own methods, and later with the D&D ruleset itself. Magic likewise was a system of Arneson's own invention, borrowing only a handful of spell descriptions from CM. Large scale battles, logistics and wargame campaigning, while they drew organizational and statistical information from CM were designed in accordance with their usual Strategos ruleset to the extent we can determine. Given the information highlighted in this article, how then should we characterize the relationship between CM and Blackmoor? Is it proper to refer to Blackmoor as a CM campaign? Perhaps the best way to answer that question is through analogy. Suppose, I decided to start a Napoleonics campaign with the locals using Wesely's Strategos N rules (not so hypothetical as I really would like to do that someday). As it happens the Strategos N rules have no information on Unit costs, troop types of various nations, organizational differences, national wealth and logistics, and so on. To run a campaign you would certainly need all that information. Fortunately, I have a copy of Bruce Quarrie's wonderful little book "Napoleons Campaigns in Miniature", and I would happily turn to that book for all the needed supplemental information, while completely ignoring the last chapter therein where Quarrie presents his own set of rules. So if someone asked me, I would tell them I was running a Strategos N campaign. I might add I was supplementing Strategos with information from Quarrie, but never would I claim or endorse the claim that I was running a "Quarrie Campaign"
To the extent any single ruleset can be claimed as primary, Blackmoor was a Strategos campaign, wherein CHAINMAIL functioned as supplemental information; a sourcebook for ideas, a primary Monster Manual, and a kind of guide to medieval typologies. This does not mean that no battle was ever fought with CHAINMAIL, or Moreshauser, or Featherstone rules - all of which are entirely possible. It means that Strategos was the norm running in the background, the familiar set of rules that Arneson and company would fall back on. In retrospect, it is hardly surprising that Arneson would exploit the easy to hand information present in CM, while continuing to game with the rules he and the other Twin Cities gamers knew by heart. The rules of Blackmoor developed in the mileau of Strategos on the heels of Braunstiens and Ancients and medieval battles. It was not a "CHAINMAIL campaign".